Figure 27.3. Calculated reduction of κ sFLCs in a patient with LCMM and renal failure by chemotherapy. Model assumes either 100% (immediate) tumour killing (1) or 10% per day (2). 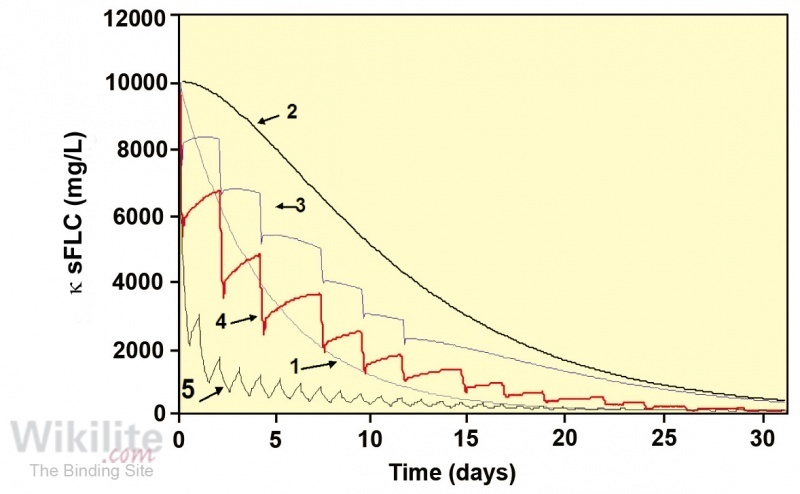 The effect of 6 x 3.5 litre plasma exchanges over 12 days is indicated (3) based on 10% kill per day (2) plus the addition of haemodialyis for 4 hours, x 3 per week (4) and 8 hours/day (5). Figure 27.4. Changes in (A) eGFR and (B) sFLCs in 14 patients with MM receiving bortezomib plus plasma exchange. Data for patients in the two panels are identified by lines of the same colour. (From Copyright © 2011 Massachusetts Medical Society. Reprinted with permission from Massachusetts Medical Society). In the largest randomised control trial of plasma exchange that included 107 patients with severe AKI associated with MM, Clark et al. failed to demonstrate any benefit of plasma exchange for either renal recovery or overall patient survival. However, renal biopsy information was not available for all patients in the trial (so a diagnosis of cast nephropathy was not established) and sFLCs were not measured. Regarding the lack of sFLC measurement, a subsequent editorial in the Journal of the American Society of Nephrology  commented “This resembles anti-hypertensive treatment without measuring blood pressure.” Clearly, the efficiency of plasma exchange for FLC removal could not be judged. In a small study of 18 patients with biopsy-proven cast nephropathy, who were treated with bortezomib and plasma exchange, Leung et al. concluded that patients were more likely to recover renal function if a 50% reduction in sFLC concentrations was achieved. For patients with pathologies other than cast nephropathy, the recovery of renal function did not depend on sFLC reduction, emphasising the necessity for biopsy confirmation of cast nephropathy when interpreting trial data. In order to understand the efficiency of plasma exchange for FLC removal, Hutchison et al. developed a compartmental mathematical model that was applicable to patients being treated for MM and renal failure. The following parameters were included: 1) sFLC concentrations at clinical presentation; 2) monomeric κ and dimeric λ clearance rates with and without renal failure; 3) partition of sFLCs between vascular and extravascular compartments (including oedema fluid); 4) flow of FLCs between compartments; 5) half-life of sFLCs in renal failure; 6) sFLC production rates; and 7) tumour killing rates with chemotherapy. Figure 27.3 displays the calculated clearance of κ FLCs in a light chain MM (LCMM) patient with renal failure treated with chemotherapy (assuming 10% tumour kill per day, Line 2). 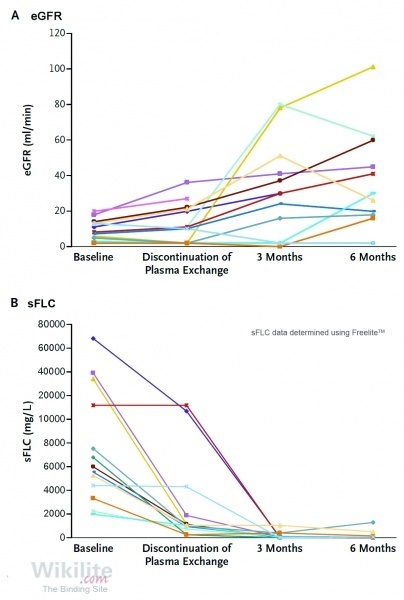 Addition of 6 plasma exchange treatments over 12 days is shown Figure 27.3, Line 3), and the rapid reductions in sFLC concentrations during the procedure and their subsequent re-entry from the extra-vascular to the intra-vascular compartment can be observed. Plasma exchange increased removal rates by approximately 25% but concentrations were not reduced below toxic levels (500 mg/L) at 4 weeks. Therefore, the lack of success of plasma exchange may be explained by the limited duration and frequency of this procedure, combined with on-going high production rates due to ineffective chemotherapy and re-entry of FLCs from extravascular compartments. In 2010, an IMWG consensus statement acknowledged that “The role of plasma exchange in patients with suspected light chain cast nephropathy and renal impairment is controversial” . A 2011 report of 14 patients with biopsy-proven or high probability cast nephropathy (defined as sFLC >2000 mg/L), treated with a combination of bortezomib-based chemotherapy plus a median of 8 plasma exchanges, described good patient outcomes. A partial renal response (PRR) or better was achieved in 86% of patients (a PRR was defined as a >50% reduction in serum creatinine from the maximum value, or freedom from haemodialysis within 6 months among patients who were initially undergoing haemodialyisis) . The median time to the discontinuation of plasma exchange was 8 days (range 4 to 23) during which time the mean reduction in sFLCs was 74.6% (range 36.6 to 96.3%), and 6 patients had complete recovery of renal function within 6 months (Figure 27.4). However, this study did not include a control group so it was not possible to separate the efficacy of the chemotherapy from that of the plasma exchange. Premuzic et al. compared sFLC concentrations in MM patients treated with chemotherapy alone or in combination with plasma exchange (2-5 sessions). Although there was no significant difference in outcome between the two groups, reductions in sFLC concentrations post-treatment were associated with improved survival (p<0.001).